Ramos-Carmona, S., Delgado-Balcázar, S., and Perez, J. F. (2017). "Physicochemical characterization of torrefied wood biomass under air as oxidizing atmosphere," BioRes. 12(3), 5428-5448. The effects of torrefaction under an oxidizing atmosphere on the physicochemical properties of patula pine wood chips were studied. Raw and torrefied pine were characterized to evaluate the effect of temperature and residence time on biofuel properties, such as bulk density, equivalent Hardgrove grindability index (HGIeq), ultimate and proximate analyses, heating value, and fuel value index (FVI). In contrast, the torrefaction process was characterized by mass and energy yields, and by the energy-mass co-benefit index (EMCI). Torrefaction was performed in a rotary kiln at temperatures between 180 °C and 240 °C during residence times between 30 min and 120 min. The torrefaction process under an oxidizing atmosphere tended to increase the fixed carbon/volatile matter ratio (from 0.19 to 2.5), while the H/C and O/C atomic ratios decreased 73% and 55%, respectively. The best properties of wood reached in the experimental plan were obtained at 210 °C during 75 min. For this torrefaction condition, energy yield, FVI, and EMCI were 85.91%, 1.91 MJ/cm3, and 4.41%, respectively. Additionally, the lower heating value for torrefied pine (18.65 MJ/kg) was higher than for the raw material (17.76 MJ/kg), and the HGIeq was 17% greater, which resulted in a better grindability behavior. The increase in greenhouse gas emissions have promoted the use of biomass for renewable energy (National Climatic Data Center (NOAA) 2015). Forest biomass is advantageous for its energy potential, due to its large and decentralized availability. It can be used as feedstock to produce bioenergy and/or bioproducts under thermochemical biorefinery applications (Commission Staff Working Document 2014). The use of biomass as feedstock for thermochemical or manufacture processes provides an alternative to fossil fuels, such as coal, oil, and natural gas (U.S. Energy Information Administration 2015). Short rotation and fast growing biomasses could be a feasible energy source due to the low global warming potential of CO2 emissions (Liu et al. 2017). This fact alone helps to achieve the goals proposed during the 21st Conference of the United Nations Framework Convention on Climate Change (COP21– Paris 2015) to face the greenhouse emissions issue (Díez and Pérez 2017). Biomass shows several disadvantages regarding fossil fuels (e.g. coal), due to its low bulk density and heating value (Arias et al. 2008; Manunya Phanphanich et al. 2011). The average gross heating value of wood biomass is about 20.2 MJ/kg with regard to Colombian coals, which ranges between 27.7 and 33.9 MJ/kg; therefore, large amounts of biomass are needed to satisfy a given energy demand (Lenis et al. 2013; Pérez et al. 2015). Moreover, wood biomass has a high moisture content, which makes it difficult to grind and store due to fungal degradation (Hakkou et al. 2006). Torrefaction is used as a feasible strategy to improve and to homogenize wood biomass properties for thermochemical processes, such as combustion, gasification, and pyrolysis (Deng et al. 2009; Manunya Phanphanich et al. 2011; Chen et al. 2014b). Torrefaction is a mild-pyrolysis process at temperatures ranging from 200 °C to 300 °C, during different residence times (commonly less than 1 h) under an inert atmosphere (Chen et al. 2014b). During the torrefaction process, the heating value of biomass increases due to the reductions in moisture content, and H/C and O/C atomic ratios (Arias et al. 2008). Furthermore, torrefied biomass becomes hydrophobic due to the thermal degradation of hemicellulose. The hydrophobic nature of torrefied biomass allows for extending the storage periods (Hakkou et al. 2006); moreover, the grindability properties of pretreated biomass improve relative to those of the raw material (Arias et al. 2008; Repellin et al. 2010; Ciolkosz and Wallace 2011). It has been reported that after torrefaction, the elemental composition of biomass tends to be similar to the char composition (Bergman et al. 2005). Nevertheless, despite the advantages that a torrefied biomass offers, torrefaction increases the operation costs due to the cost associated with the inert gas supply (e.g. nitrogen) as the carrier gas (Lu et al. 2012). Among the strategies to reduce the costs related to the carrier gas, the torrefaction is performed under an oxidizing atmosphere using air as carrier gas instead of nitrogen (Chen et al. 2014a). Different authors have studied the effect of air as the carrier gas on the torrefaction process performance. Rousset et al. (2012) studied the effect of oxygen concentration in the carrier gas on the torrefaction process. Oxygen concentrations were 2 vol %, 6 vol %, 10 vol %, and 21 vol %, with torrefaction temperatures of 240 °C and 280 °C for 1 h of residence time. The authors stated that the oxygen concentration did not significantly affect the composition of the solid by-product for low torrefaction temperatures. Therefore, they recommended to use an inert atmosphere for torrefaction temperatures above 280 °C to avoid the oxidation of volatiles released during the process. Similarly, Wang et al. 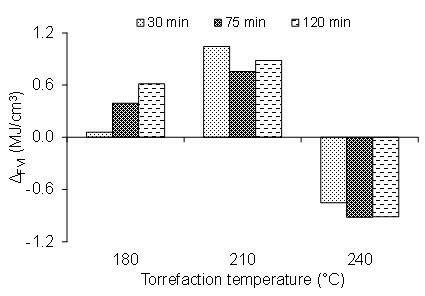 (2013) analyzed the effect of temperature and oxygen concentration on the torrefaction process. Oxygen increases the degradation rates of hemicellulose, leading to decreased residence times. Moreover, the energy consumption during torrefaction decreases, due to the heat released as a consequence of oxidation reactions of volatiles with the carrier gas. Other authors have evaluated the effect of temperature and particle size on torrefied biomass properties under oxidizing atmospheres. Lu et al. (2012) studied the effect of carrier gas type (inert and oxidizing) and temperature on characterization of oil palm fiber and eucalyptus. Palm fiber is not suitable for oxidative torrefaction, because its high surface/volume ratio enhances mass loss during the upgrading process, which leads to lower energy yields. For eucalyptus, air can be used as the carrier gas during torrefaction, but at lower temperatures. Uemura et al. (2013) reported that particle size does not have a significant effect on mass yield, because this yield depends on the hemicellulose content in biomass, which is the most affected wood constituent during the torrefaction process. Chen et al. (2013, 2014a, 2016) conducted different studies of the torrefaction process varying biomass type, carrier gas and its superficial velocity, and temperature. Unlike Uemura et al. (2013), Chen et al. reported that under an oxidizing atmosphere, thermal degradation of wood was highly dependent on particle size, i.e. the surface area of the treated material. Likewise, as the oxygen concentration in the carrier gas increases, H/C ratio decreases, because oxygen reacts more readily with hydrogen than with carbon. Oxygen concentration does not affect the fixed carbon content if torrefaction temperature is below 300 °C. This result agrees with the findings reported by Wang et al. (2013). Despite the wide research about torrefaction using air as the carrier gas described above, there is a lack of information about the effect of the oxidizing environment on the physical properties (e.g. bulk density and grindability) and fuel properties different to the heating value of wood biomass. The objective of this study is to analyze the effect of torrefaction temperature and residence time under an oxidizing atmosphere (air) on the physicochemical and fuel properties of patula pine wood chips. This fast growing wood biomass is suitable to be torrefied under oxidizing atmosphere, like the eucalyptus, because its higher cellulose and lignin contents lead to more thermal stability of the pretreated material (Chen and Kuo 2010; Lu et al. 2012). Raw and torrefied materials are characterized by means of bulk density, equivalent Hardgrove grindability index (HGIeq), proximate and ultimate analyses, and fuel value index (FVI). Additionally, the torrefaction process is characterized by the mass and energy yields and energy-mass co-benefit index (EMCI). A complete characterization of raw and torrefied material will allow the identification of the importance of strategies to upgrade the quality of wood biomass as biofuel (e.g. torrefaction) for further thermochemical processes applications under a low-cost atmosphere (air). Currently, Colombia produces around 10.4 million m3 of wood for domestic consumption exclusively. This wood volume represents 80% of the national production. Unfortunately, the majority of these crops come from natural forests, which do not meet the sustainability criteria (Pérez and Osorio 2014). In contrast, the country has a potential of 17 million ha that is suitable for forestry. Antioquia, Caldas, and Córdoba are the states with the biggest forest planted areas for commercial purposes under sustainability criteria. In these planted areas, the most common species are pines (Pinus patula and Pinus tecunumanii), and cedar (Cupressus lusitánica) (ProExport 2012). Besides its large planted area, patula pine has a high mean annual increment (MAI, approximately 20 m3/ha/year) and low harvesting time (13 years) (Pérez and Osorio 2014). In this study, small-diameter logs were obtained from a commercial sawmill located nearby Medellín, Colombia. The wood sample was previously debarked and then chipped using a Bandit 95XP chipper (Bandit Industries, Inc., Remus, MI, US), then placed on the floor and dried at room conditions for two weeks. The dried wood chips were sieved manually with metal sieves for 10 min and classified by size. The particle size selected to be torrefied was between 10 mm and 20 mm because some thermochemical processing technologies (e.g. fixed bed gasification or combustion) operate with this size range (Pérez et al. 2012). Experiments were performed in a batch rotary kiln (Terrigeno industry® and University of Antioquia, Medellin, Colombia), pictured in Fig. 1. The drum (5) was coupled to a variable speed drive system composed by a sprocket-chain system and an electrical worm gear reducer (9, 10, and 11). The reactor capacity ranged from 2 kg to 3 kg, regarding the biomass bulk density. Electrical resistors (13) heated the reactor, in which the temperature was measured by a K-type thermocouple (T1, Termocuplas S.A., ± 1.0 ºC) and adjusted by a Maxtech PID Model No. SS2440DZ controller (12). The K-type thermocouple (T2, Termocuplas S.A., ± 1.0 ºC) measured the temperature outside the reactor to be sure that the torrefaction temperature had been reached. A programmable PID controlled the temperatures and heating rate of the reactor drum using the signals of the two thermocouples T1 and T2 as input variables; the control signal of the target torrefaction temperature is the temperature T2. The air used as carrier gas was provided by a reciprocating compressor (1) coupled to a plenum (2) to absorb piston oscillations. Pressure and flow were regulated/measured by means of a manometer (3) and a rotameter (4), respectively. The reactor was isolated with a ceramic wall (7) and an air chamber (8) to avoid high heat transfer rates to the surroundings. Biomass samples were fed in a sample holder (6) to control the initial and final amount of biomass during the torrefaction process. The sample holder consisted in a stainless-steel tube (internal diameter 82.55 mm and length 170 mm) covered by a mesh of 0.149 mm size; the mesh allowed dragging the released volatile matter during torrefaction by the carrier gas. The torrefaction tests were conducted with 50 g (± 1 g) of patula pine wood chips. The heating method was programmed with a heating rate of 10 °C/min, and the residence time started once the target temperature was reached. Air flow fixed in the experiment was 1 standard liter per minute (sLpm) to obtain a superficial velocity of 0.14 mm/s inside the reactor. Torrefaction temperatures defined for this work were 180 °C, 210 ºC and 240 °C. The residence time varied from 30 min, 75 min to 120 min. The levels of the factors considered in this work were similar to the settings used by other authors. Low superficial velocities of the carrier gas allowed large mass yields obtained during the torrefaction process (Chen et al. 2013), and Joshi et al. (2015) reported ignition zones of biomass at 240 ºC using air as carrier gas in the torrefaction process. Table 1 shows the experimental set conditions in this work. Additionally, a severity factor (SF) was introduced, which quantified the torrefaction severity combining temperature and residence time. Equation 1 shows how to determine the severity factor of a torrefaction condition, as stated by Na et al. (2014). 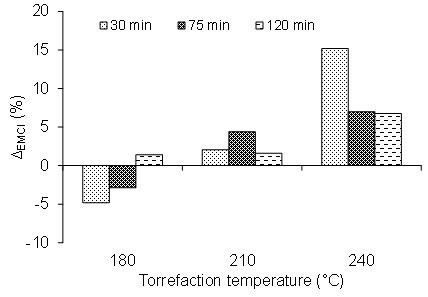 where t is the residence time (min), Ttorr and Tr are the torrefaction temperature and a reference temperature (°C), respectively; the Tr is often 100 °C (Na et al. 2014). It is considered that a temperature above 100 °C promotes not only moisture evaporation, but also the release of volatile matter present in the wood. After the torrefaction process, the pine wood chips were ground and sieved using a 35-mesh screen, where the passed fraction was used in the further characterization. Mass yield (my) is a measure of the remaining amount of biomass after torrefaction process and is determined by Eq. 2 (Chen et al. 2015). The mraw and mtorr are the initial and final mass of material after the torrefaction process (g). The torrefaction process was conducted in triplicate. The energy yield (Ey) indicates how much energy is retained in the biomass after the torrefaction process relative to the initial energy content in the raw material (Chen et al. 2015). This parameter involves the mass and heating value changes, as shown in Eq. 3. The LHVraw and LHVtorr are the initial and final lower heating values of biomass after torrefaction process in kJ/kg. The energy-mass co-benefit index (EMCI) was proposed by Lu et al. (2012) to quantify the enhancement of energy content of the remaining mass after the torrefaction process. The EMCI (%) is the difference between the energy and mass yields (Eq. 4). Thereby, the EMCI is the product between the mass yield and the heating value gained with torrefaction process. To determine how the torrefaction under an oxidizing atmosphere affects the physicochemical properties of patula pine, the following characterizations were performed. Bulk density (ρbulk) is defined as the ratio between the mass of a material and its volume, including the void volumes of internal pores (Souza-Santos 2004). To determine this parameter, a vessel with known volume (Vvessel, m3) was filled with the dried biomass and neither shaken nor pressed, and it was weighted to estimate the mass change (mbms, kg). Equation 5 allowed the calculation of the bulk density of the different samples. For each condition, the procedure was conducted five times. The moisture, volatile matter, fixed carbon, and ash contents associated to the proximate analysis of each sample were determined by means of a thermogravimetric analyzer Q50 (TA Instruments, New Castle, USA). The method to conduct the analysis proposed by Medic et al. (2012) was modified taking into account the ASTM D 3174-12 standard to determine the ash content (ASTM International 2012). The modified TGA method is presented in Table 2. Several gasification and combustion technologies (fluidized or entrained reactors) require pulverized biomass as feedstock; therefore, it is important to know the effect of the torrefaction process on the biomass grindability behavior (Manunya Phanphanich et al. 2011). The Hardgrove grindability index (HGI) is used to classify the grindability of several coals (ASTM D409/D409M-11a (2012)). However, it was performed as an equivalent adaptation valid to char and biomass, as reported by Bridgeman et al. (2010) and Ibrahim et al. (2013), who developed a modified version of the Hardgrove Grindability Index to calculate an equivalent HGI for different kinds of raw and torrefied biomasses. In this work, the equivalent Hardgrove grindability index (HGIeq) by means of a correlation in function of the composition of raw and torrefied biomasses taken from the literature was estimated. An analysis of variance (ANOVA) (Statgraphics® software, version Centurion XVI, Warrenton, US) was conducted taking into account the experimental data of HGIeq as a function of ultimate and proximate analyses of different kinds of raw and torrefied biomasses published by Ohliger et al. (2013); Ibrahim et al. (2013); and Williams et al. (2015). According to the ANOVA (see Appendix A), the proximate analysis had a significant effect on the HGIeq with a confidence level of 95%. Therefore, a correlation to estimate the HGIeq in function of the proximate analysis was fitted by the multiple regression analysis, as shown in Eq. 6, with R2 = 0.93. The volatile matter (VM) and ash contents of biomass were in wt.% on a dry basis. A CHNSO LECO Truspec Micro equipment (Leco®, St. Joseph, MI, US) was used to estimate the ultimate analysis of the samples. Tests were conducted, according to the ASTM D 5373-08 (2012) standard. The carbon, hydrogen, and nitrogen analyses were performed in a helium environment at 1050 °C; whereas the oxygen content was determined by the mass difference. The tests were conducted in triplicate. where C, H, and N are the carbon, hydrogen, and nitrogen contents from the ultimate analysis in wt.% on a dry basis, respectively. To observe the effect of the torrefaction process on the heating value of biomass, the lower heating value (LHV) was used in this study. The LHV is calculated by the correlation presented in Díez and Pérez (2017), LHVdb=HHVdb-2260 Mdb – 20300Hdb, where HHVdb (kJ/kg) is the higher heating value on dry basis, Mdb is the moisture content of the sample (%dry basis), and Hdb is the hydrogen (% dry basis). The fuel quality of biomass torrefied at different temperatures and residence times was quantified by means of the fuel value index (FVI). This parameter was a measure of the global properties of biomass as solid biofuel. FVI was related to important properties, such as the heating value, bulk density, and ash and moisture contents (Purohit and Nautiyal 1987; Cuvilas 2015; Ojelel et al. 2015). The FVI is a more accurate volumetric energy density, because it quantifies the effect of the moisture and ash contents on the energy density of biomass (Díez and Pérez 2017). Figure 2 shows the mass yield of patula pine for the different torrefaction conditions. For torrefied material at 180 °C, the mass yield was approximately 88%, regardless of the residence time of the experiment. The mass losses associated with these torrefaction conditions were attributed mainly to the biomass drying and the release of low-molecular-weight volatiles (Lu et al. 2012). When the torrefaction temperature increased to 210 °C, the mass losses increased with residence time, and were more notable between 30 min and 75 min. At the most severe temperature condition (i.e., 240 °C), the mass losses were higher than 60%. This behavior was obtained because, between 210 °C and 240 °C, the oxidation reactions are activated, leading to biomass carbonization (Lu et al. 2012; Chen et al. 2014b). When the residence time was increased from 75 min to 120 min, there was no significant effect on the mass yield for the different evaluated torrefaction temperatures. Chen et al. (2010) reported similar behavior for torrefied biomass under an inert atmosphere. By means of a TGA analysis, they showed that the mass loss during the torrefaction process at 240 °C and 275 °C was stabilized after 60 min of residence time. Lu et al. (2012) reported similar results for the mass yield for torrefied eucalyptus under an oxidizing atmosphere. However, the similar mass yields were achieved at a higher temperature (325 °C). This was due to the geometries used in their study that were cut blocks of 10 mm × 15 mm × 20 mm, which had a lower surface/volume ratio than wood chips. Larger surface areas improved the heat and mass transfer during the torrefaction process, which led to higher mass losses in the torrefied material. Several authors have stated that surface oxidation is the dominant phenomenon in torrefaction under an oxidizing atmosphere (Chen et al. 2013; Uemura et al. 2013; Wang et al. 2013). Figure 3 shows the effect of the torrefaction process on energy yield. For torrefaction conditions of 180 °C during 30 min and 75 min, energy yield was quite similar. This behavior was attributed to the balance between the heating value gains and mass losses during the torrefaction process (see Fig. 2 and Table 3). At 180 °C, increasing residence time up to 120 min led to an increase in the energy yield of torrefied patula pine. At this torrefaction temperature, mass yield did not change meaningfully, while heating value increased, due to changes in chemical composition of pine (see composition and heating value section). For torrefied patula pine at 210 °C, energy yield diminished when residence time increased. A higher residence time enhanced mass losses that could not be compensated by the heating value increase. The lowest energy yields were reached when torrefaction temperature was 240 °C, due to higher mass losses favored by the degradation of wood biomass by the oxidation reactions. Regarding residence time, a torrefaction during 30 min at 240 ºC, led to the highest energy yield. This behavior was due to a lower residence time avoiding high thermal degradation of biomass; therefore, less energy was released during torrefaction. Unlike this study, Chen et al. (2014a) obtained higher energy yields, although they conducted torrefaction experiments at higher temperatures than 240 °C (45 °C higher approximately). Results reported by these authors could be associated with differences in experimental setup and the biomass particle size and shape (cut blocks). In contrast, similar results to this work were reported by Lu et al. (2012), who obtained low energy yields, around 36.5%, for torrefied eucalyptus at 350 ºC, this temperature favored the carbonization of the material. Thereby, it is worth mentioning that the particle size and shape of biomass are fundamental variables that affect the torrefaction process. These parameters will be discussed in future works. Figure 4 shows the relative change of the EMCI for the different torrefaction conditions regarding the raw material (baseline). 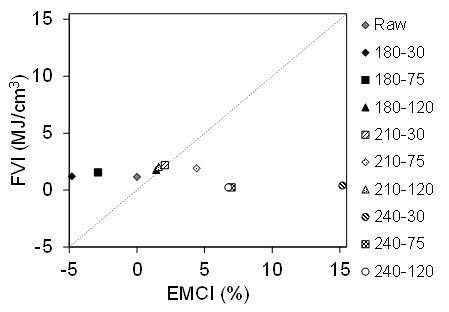 It can be observed that torrefaction at 180 °C during 30 min and 75 min had a negative effect on the EMCI, which was associated with the low change in the LHV regarding raw pine. At these torrefaction conditions, torrefied pine exhibited small changes in its elemental composition. For other torrefaction conditions (210 °C and 240 °C), a positive effect on the EMCI was obtained. Torrefied pine at 210 °C led to a relative increase in the EMCI values up to 4.5%, which could have been explained by a more noticeable heating value gain that overcame the mass losses during the torrefaction process. The highest relative increase of the EMCI (approximately 16% higher regarding raw pine) was achieved for torrefied pine at 240 °C during 30 min. This increase was associated with the higher carbon content for pretreated pine under this condition (see composition and heating value section). 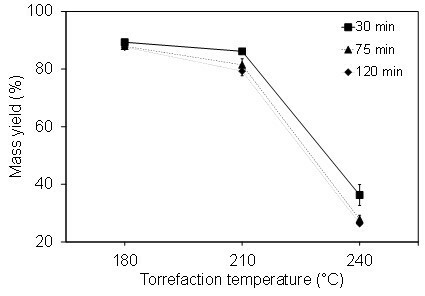 When residence time increased for this temperature condition, the EMCI relative increase was lower, due to oxidation reactions favored during torrefaction at 240 °C. Figure 5a shows the bulk densities of raw and torrefied patula pine. In general, bulk density tended to decrease with the increase of torrefaction temperature. Nevertheless, at 180 °C, there were no differences regarding the raw material (± 2.5%) when residence time increased. At this torrefaction temperature, low mass losses occurred (approximately 10%, see Fig. 2) and were mainly associated with biomass drying instead of volatiles release (Oliveira and Rousset 2009). When torrefaction was performed at 210 °C, the bulk density of torrefied pine tended to decrease (5% to 10%). At this temperature, mass losses became more considerable (14% and 20%, see Fig. 2) as a consequence of the thermal degradation of wood constituents (hemicellulose and cellulose) (Rousset et al. 2012). Additionally, biomass particle size did not change considerably. Thereby, the synergy of these phenomena led to lower bulk densities of the pretreated material. The lowest bulk densities were obtained at 240 °C. The density of pretreated pine reached values of approximately 30% of the raw material bulk density. This result was attributed to the higher mass losses during the torrefaction process, due to thermal degradation of wood constituents and by the carbonization reactions favored at this temperature condition. For this torrefaction temperature, it was expected a severe or complete thermal degradation of wood constituents, namely hemicellulose and cellulose. Furthermore, the fixed carbon of torrefied pine decreased with residence time for this torrefaction temperature, as described in the composition and heating value section, which led to a reduction of the biomass particle size during the torrefaction process. Consequently, at 240 ºC, bulk density increased with the increase of residence time because the particle size decreased, as shown in Fig. 5a. Figure 5b shows the HGIeq as a function of the torrefaction severity factor (Table 1), to show the progressive change in the grindability behavior of the pretreated material. An increase in the process severity favored the grindability of pine wood chips, particularly under the most severe conditions (240 °C). Ohliger et al. (2013) reported that biomass grindability increased when mass losses surpassed 30%, due to the thermal degradation of hemicellulose. A higher HGIeq was associated with lower energy consumption required to grind torrefied material (Williams et al. 2015). Ibrahim et al. (2013) presented values of HGIeq for different wood biomass torrefied at different temperatures (270 °C and 290 °C) and time conditions (30 min and 60 min) under an inert atmosphere. Their results for torrefied eucalyptus (HGIeq = 38.9 to 46.8) were similar to the results obtained in this study. Figure 6 shows the physical changes that occurred during torrefaction of patula pine wood chips at different pretreatment conditions. It can be seen how torrefaction severity affected the wood chips color. Torrefied pine at 240 °C had a char-like appearance, due to the carbonization reactions occurred during the pretreatment. Changes in the color of torrefied materials resulted from the oxidation of phenolic compounds, presence of reduced sugars and amino acids, release of formaldehyde, and aromatization and polycondensation reactions (Pelaez-Samaniego et al. 2014). Table 3 shows the proximate analyses for raw and torrefied patula pine at different pretreatment conditions. All torrefied samples at 180 °C and 210 °C during 30 min exhibited a slight decrease in their VM contents. At 210 °C, the release of VM increased with residence time. A reduction of VM content led to a relative increase of fixed carbon (FC) content in the torrefied materials. According to Rousset et al. (2012), this release of volatiles is mainly associated with the thermal degradation of hemicellulose at low torrefaction temperatures no matter whether the environment is inert or oxidizing during the torrefaction process. In this work, different results were obtained from those reported by Lu et al. (2012), who also studied wood torrefaction under an oxidizing atmosphere. At 250 °C, they reported higher VM content (approximately 15%) than the concentration reached in this work at 240 °C. This difference was attributed to the higher size and shape of biomass studied by Lu et al. (2012). For torrefied pine at 240 °C, there was a considerable decrease of VM, which was associated with the severe or complete thermal degradation of the major wood constituents (i.e. hemicellulose and cellulose). During torrefaction at this temperature condition, it was evidenced that oxidation reactions appeared. Regarding FC content, the pretreated pine reached concentrations of approximately 70%. This composition was close to that of a biochar; thereby, these conditions are more associated with a carbonization process than with a torrefaction one (Lu et al. 2012; Chen et al. 2014a). Biomass carbonization led to an improvement in the heating value regarding the raw material (Chen et al. 2016). Peláez-Samaniego et al. (2014) reported a similar char-like material for a torrefaction process under an inert atmosphere. In this study, FC content of torrefied pine at 240 °C diminished with the increase of residence time. A longer residence time favored secondary oxidation reactions in the carbonaceous material, which negatively affected the heating value. 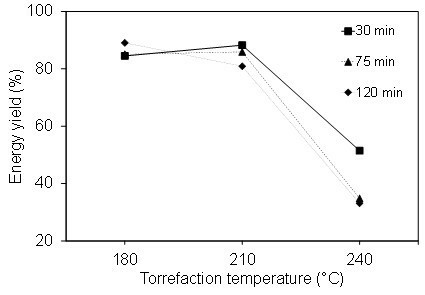 The effect of torrefaction severity on wood elemental composition is shown in Fig 7a. At 180 °C during 30 min and 75 min, pine composition was quite similar to the raw material, because at these conditions the drying was the main favored subprocess. For other torrefaction conditions, the carbon content tended to increase (up to 40%), while hydrogen and oxygen contents tended to decrease (up to 66% and 37%, respectively) with torrefaction severity. At 240 °C, pine composition changes became higher; the highest carbon content was obtained at this temperature for 30 min. However, at 240 °C, the carbon content diminished with residence time, due to the oxidation reaction. Another way to see the effect of torrefaction on patula pine composition is through the Van Krevelen diagram (Fig. 7b). This figure shows the changes in the atomic H/C and O/C ratios for the different torrefaction conditions. Both ratios tended to decrease with torrefaction severity, especially the most severe changes were reached at 240 °C. Reductions of these atomic ratios were associated with the volatiles release, due to the thermal degradation of wood constituents, that led to an increase in the heating value of the torrefied pine (Table 3) (Bergman et al. 2005). The atomic H/C ratio of torrefied biomass under an inert atmosphere tended to be higher than what was obtained under an oxidizing atmosphere for the same temperature conditions (Lu et al. 2012). This result was due to the thermal degradation of elements such as hydrogen and oxygen, associated with the decomposition of wood constituents. The thermal degradation during torrefaction was favored by the oxidizing environment, which led to a relative increase in the carbon content of pretreated materials (Lu et al. 2012), while for an inert atmosphere, it was required higher torrefaction temperatures to reach a reduction in the H/C ratio. For instance, in this study, at 210 °C during 75 min (FS = 5.11), an 8% reduction was obtained in the H/C ratio; whereas, under an inert atmosphere to reach a similar H/C reduction with ponderosa pine, it was required to pretreat the wood at 275 °C during 30 min (SF = 15.3, according to Eq. 1) (Pelaez-Samaniego et al. 2014). 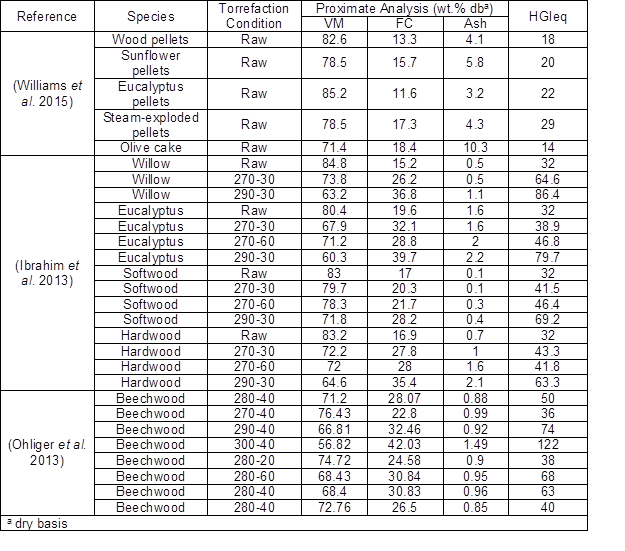 The LHV for raw and torrefied biomass is shown in Table 3. Torrefied pine at 180 °C during 30 min and 75 min had a lower LHV than raw pine (approximately 5%). This reduction was mainly attributed to the error associated with the correlation used (Eq. 7) to estimate the HHV. For the other torrefaction conditions, this parameter tended to increase with torrefaction severity; this was attributed to the reduction of the H/C and O/C ratios (composition and heating value section). The highest LHV was obtained for 240 °C and 30 min of residence time (23.9 MJ/kg). The increase in the heating value of torrefied biomass allowed obtaining higher efficiencies in further thermochemical processes, such as gasification, combustion, and pyrolysis (Chen et al. 2014b). Figure 8 shows the relative change in the FVI for the torrefied pine regarding the raw material (baseline). The most severe conditions (i.e., 240 °C) had a negative effect on pine wood chips as solid biofuel. The lower FVI was due to the drastic reduction in the bulk density (Fig. 5a) that could not be compensated by the higher heating value of these materials. Additionally, these samples had higher moisture contents because of the oxidation reactions that could produce water vapor during the torrefaction process (Table 3) (Rousset et al. 2012). In contrast, at 180 °C, the biomass FVI tended to increase. Nevertheless, this enhancement was mainly attributed to biomass drying because the bulk density, composition, and heating value did not change meaningfully. Therefore, the best torrefaction conditions to obtain high-quality fuel were reached with a torrefaction temperature of 210 °C. These torrefaction conditions exhibited a considerable decrease in the moisture content on wet basis (around 60%), and an increase in the LHV (around 5%); which compensated for the lower bulk density and higher ash content regarding raw pine. To find the best torrefaction condition for this study, it was proposed to analyze the torrefaction process performance and the fuel quality of torrefied pine. Figure 9 shows the relation between the FVI and EMCI for each torrefaction condition. Moreover, a hypothetical linear behavior of the two indices was submitted; this ideal line showed that an increase in the EMCI led to a proportional increase in the FVI or vice versa. Torrefaction of patula pine at 210 °C during 30 min was the condition that better adjusted to the straight line, followed by torrefaction at 180 °C and 210 °C during 120 min. However, torrefaction at 210 °C during 75 min was the more suitable mode to upgrade patula pine. Despite that this condition had a lower FVI (Fig. 8), its EMCI was higher than that obtained at 210 °C for 30 min (Fig. 4). Therefore, according to the experimental plan conducted in this work, it was highlighted that to pretreat wood biomass (at 210 °C for 75 min) under an oxidizing atmosphere led to produce an upgraded biofuel with a FVI of 1.15 MJ/cm3 with a process improvement of 4.4%. 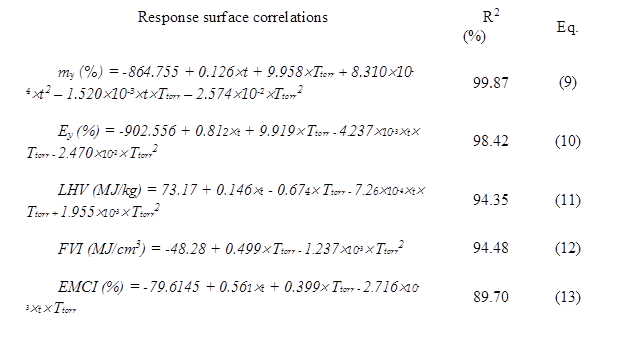 The analysis of the response surface of answer variables is reported according to the statistical experimental design. Correlations of mass and energy yields, LHV, FVI, and EMCI have been fitted in function of torrefaction temperature (Ttorr in ºC) and residence time (t in min) using Statgraphics® software (version Centurion XVI, Warrenton, US). According to the statistical analysis of the experimental data, analyzing the coefficients of the response surfaces, it is possible to state what factors are statistically meaningful and how the answer variable is affected if Ttorr and/or t increase. The results of response surfaces and their R2 are shown in Eqs. 9 to 13. The statistical R2 obtained through the data fitting of the experimental design indicated that the factors taken into account (torrefaction temperature and residence time) explained between 89.7% and 99.87% of the variability of the response variables associated to the torrefaction process using air as carrier gas under conditions of this work. The mass and energy yields of torrefied patula pine decreased when temperature increased. Mass losses could be above 70% when the torrefaction temperature was 240 °C, due to hemicellulose and cellulose decomposition, and by the oxidation reactions. Likewise, at 210 °C and 240 °C, these yields also decreased with torrefaction time. The heating value gain, due to the reduction of the H/C and O/C ratios, did not compensate the higher mass losses to increase the energy yield. Physical properties of patula pine were affected by the torrefaction severity (temperature and residence time). A higher torrefaction severity implied a reduction in the bulk density up to 40% regarding raw pine (170 kg/m3). In contrast, the equivalent grindability index considerably improved with the torrefaction process. Torrefied pine at 240 °C had an HGIeq between 10 to 15 times higher than HGIeq for raw pine. To carry out a torrefaction process under an oxidizing atmosphere with severity factors below 4.72, heating at 210 °C for 30 min was not enough to cause significant changes in the chemical composition of the pretreated material. This was due to the fact that volatiles release was not favored and, hence, the fixed carbon content of torrefied wood did not change considerably. The torrefaction process at 240 °C favored the reduction of H/C and O/C ratios, which led to a higher heating value, around 41% higher, regarding the raw material. Torrefaction process at 210 °C for 75 min (SF = 5.11) was an optimum condition to pretreat pine wood because this condition favored the improvement of the torrefaction process (EMCI = 4.41%) and the quality of wood as solid biofuel (FVI = 1.15 MJ/cm3). Torrefied pine under this condition exhibited an energy yield of 85.91%, a heating value, and HGIeq increase of 5% and 17% regarding raw pine, respectively. To find an equation that helped to predict the grindability behavior (equivalent HGI index) of a torrefied biomass, a correlation of the HGIeq in function of the chemical composition of different biomasses was calculated, namely a proximate analysis. Experimental data used in this work were reported by Ibrahim et al. (2013), Ohliger et al. (2013), and Williams et al. (2015). From these works, 27 HGIeq and their experimental conditions and proximate analyses were obtained for different kinds of raw and torrefied biomasses (see Table A1). Torrefaction conditions were coded as temperature-residence time, e.g. 200-30 (it means a torrefaction conditions of 200 °C and 30 min). An analysis of variance (ANOVA) was conducted to establish whether the volatile matter, fixed carbon, ash, and their interactions had a significant effect on the HGIeq. Table A2 shows the results of the ANOVA. It could be seen that fixed carbon and its interaction did not have a significant effect on the HGIeq because this parameter was calculated by the difference in the proximate analysis. The correlation to estimate the HGIeq in function of a proximate analysis was determined by the multiple regression analysis with a R2 = 0.93. Volatile matter (VM) and ash contents of biomass were in wt. % on a dry basis. The authors acknowledge Universidad de Antioquia for its financial support to this research through the projects, “Integration Strategies of wood Planted in Colombia under Thermochemical Bio-refinery Concepts: Thermodynamic Analysis and Characterization of Bioproducts– PRG 2014-1016” and “Sostenibilidad [Sustainability] 2016-2017,” and through the Tutor student program. Also, the authors acknowledge the Environmental and Engineering Research Center of Universidad de Antioquia for its financial support through the CODI PR 15-2-09 project. The advice provided by Professor Ingry Natalia Gomez-Miranda for the statistical analysis is also acknowledged. ASTM D409/D409M-11a (2012). “Standard test method for grindability of coal by the hardgrove-machine method,” ASTM International, West Conshohocken, PA.
ASTM D5373-08 (2012). “Standard test methods for instrumental determination of Carbon, Hydrogen, and Nitrogen in laboratory samples of coal,” ASTM International, West Conshohocken, PA.
ASTM D3174-12 (2012). “Standard test method for ash in the analysis sample of coal and coke from coal,” ASTM International, West Conshohocken, PA.
Bergman, P. C. A., Boersma, A. R., Zwart, R. W. R., and Kiel, J. H. A. (2005). Torrefaction forBbiomass Co-firing in Existing Coal-fired Power Stations (Report No. ECN-C-05-013), Energy Research Centre of the Netherlands, Ultrech, Netherlands. Commission Staff Working Document (2014). State of Play on the Sustainability of Solid and Gaseous Biomass Used for Electricity, Heating and Cooling in the EUSWD(2014) 259 final, Brussels, Belgium. (http://ec.europa.eu/energy/sites/ener/files/2014_biomass_state_of_play_.pdf), Accessed 25 Oct 2016, Brussels, Belgium. Cuvilas, C. A. (2015). Mild Wet Torrefaction and Characterization of Woody Biomass from Mozambique for Thermal Applications, Ph.D. Dissertation, KTH-Royal Institute of Technology, Stockholm, Sweden. Díez, H. E., and Pérez, J. F. (2017). “Physicochemical characterization of representative firewood species used to cook in some Colombian regions,” International Journal of Chemical Engineering 2017, 1-12. DOI: 10.1155/2017/4531686. National Climatic Data Center (NOAA) (2015). “Global analysis-annual 2014,” (https://www.ncdc.noaa.gov/sotc/global/201413), Accessed 15 Sep 2016. Pérez, J. F., Barrera, R., and Salazar, C. (2015). Production of Substitute Natural Gas by means of Colombian Coals Gasification. Thermodynamic Analysis Using Aspen Plus®, University of Antioquia, Medellin, Colombia. Pérez, J. F., and Osorio, L. F. (2014). Biomasa Forestal como Alternativa Energética [Forest Biomass as an Alternative Energy], University of Antioquia, Medellin, Colombia. ProExport (2012). “Sector Forestal en Colombia [Forest sector in Colombia],” (http://www.inviertaencolombia.com.co/Adjuntos/Perfil_Forestal_2012.pdf), Accessed 8 May 2016. Repellin, V., Govin, A., Rolland, M., and Guyonnet, R. (2010). “Energy requirement for fine grinding of torrefied wood,” Biomass and Bioenergy 34(7), 923-930. DOI: 10.1016/j.biombioe.2010.01.039. Souza-Santos, M. L. D. (2004). Solid Fuels Combustion and Gasification – Modeling, Simulation, and Equipment Operation, Marcel Dekker, Inc., New York. 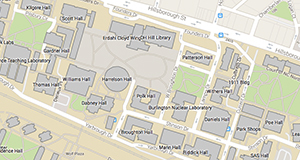 US Energy Information Administration (2015). “Biomass and the environment,” (https://www.eia.gov/energyexplained/index.cfm/%20data/index.cfm?page=biomass_environment), Accessed 22 Sep 2016. Article submitted: March 6, 2017; Peer review completed: May 22, 2017; Revisions accepted: June 8, 2017; Published: June 13, 2017.